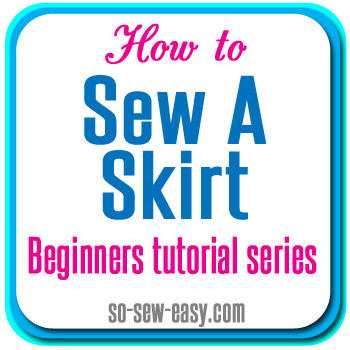 When it comes to hemming the skirt there are SO many options. You can simply turn up the hem once, press then turn up again and sew around with a regular straight stitch. Or you could do a fancy hem finish with a hemming tape or you could turn and hand stitch. You can try any of these options, or if you fancy, how about having a go at an Invisible Seam, sometimes called a Blind Hem? In invisible seam isn’t completely invisible – depending on the fabric and thread used, you might still see some regular tiny stitches. If you haven’t done this type of hem before, then do practice before trying out on your skirt. Find how to sew an invisible hem here.